¿Dónde empieza el loco y acaba el genio?La respuesta suele ser difícil, pero en este caso es casi imposible. Esta canción está dedica a uno de los más grandes genios de la pintura que ha visto la luz en España. Este es un blog de Música, por eso no perderé tiempo en explicar la vida de Salvador Felipe Jacinto Dalí i Domènech(Dalí). Fue el grupo Mecano el que le rindió homenaje a este gigante. Esta canción fue incluida por el grupo en su disco de 1988 "Descanso Dominical". 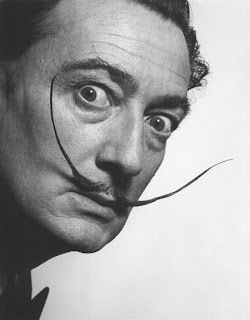 Dalí murió a los 84 años en 1989. Así que pudo escucharla...Comparto parte de su obra con este video. Ahora que ha pasado el tiempo y después de la disolución del grupo, resulta interesante ver como uno de sus principales compositores J.M Cano, ha rehecho su vida artística como un afamado pintor de éxito...¿Será Dalí que desde el cielo le ha devuelto el favor? ¿o el Karma? Aquí os dejo un programa concurso mítico de la T.V estadounidense, en el cual los invitados debían adivinar la identidad del invitado estrella. Where the madman begins and the genius finishes? The response is in the habit of being difficult, but in this case it is almost impossible. This song is dedicates to one of the biggest geniuses of the painting that has seen the light in Spain. This one is a music blog, because of it I will not lose time in explains Salvador Felipe Jacinto Dalí's life y Domènech (Dalí). It was the group Mecano the one that produced honoring to this giant. This song was included by the group on their disc of 1988 " Sunday Rest ". Dalí died 84 years in 1989. So it could listen to it... I share part of his work with this video. It is not habitual that devote themselves songs to the big Geniuses of the painting, but Mecano not only innovated in this occasion. Also they did an oda to the cinema, to the love between women, to the Dalai Lama, to the new years eve night, or to Laika, the first dog that was thrown by the Soviets to the space and a lot more. It is for it that the most habitual songs, they them were embroidering. (Already I will put others because the truth is that an honoring is deserved) Now that has happened the time and after the group dissolution, it turns out interesting to see as one of his principal composers J.M. Cano has re-done his artistic life as a famous painter of success ... will it be Dalí who from the sky has returned the favor to him? Or the Karma?